All our itineraries start and finish in Rotorua, the hub of Little Green Tours. Transfers from and to other points can be arranged at additional cost. These itineraries are designed like modules so you can add on places you want to visit, returning after your overnight stay back to Rotorua, our hub. 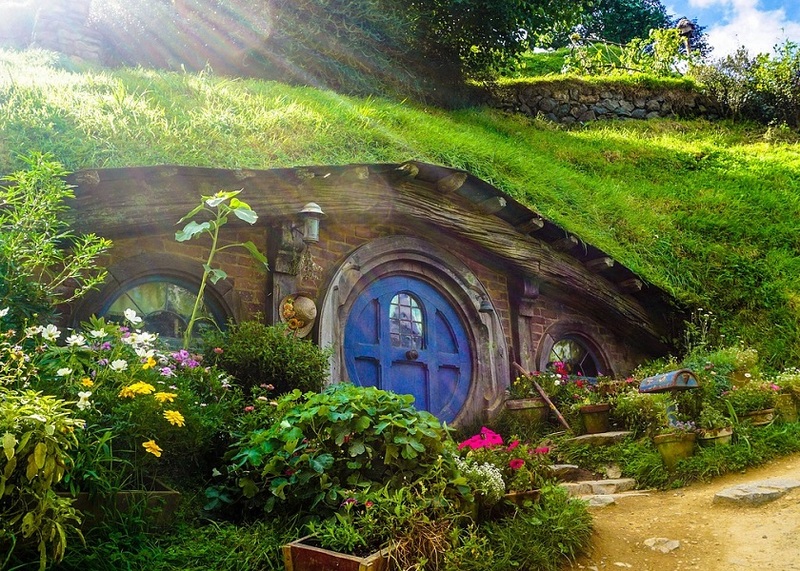 Pick up from Rotorua Accommodation and drive to Middle Earth: Hobbiton in Matamata to experience the land of the Hobbit. Guided tours of this recreated film set take approximately 2 hours and will include lunch. Continue on to Karapiro. Today we will drive over a hydro-electric dam on the Waikato River across Lake Karapiro. The man-made lake was formed behind the Karapiro hydro dam in 1947 and today it provides eight square kilometres of calm water beside 19 hectares of land known as the Mighty River Domain. It has also become the high-performance base for Rowing New Zealand and Canoe Racing New Zealand, two sports with a long tradition of success at Olympiads and world championships. Waitomo Caves is one of the must-see natural attractions in the North Island of New Zealand. The glow worm (Arachnocampa luminosa) is unique to New Zealand. Thousands of these tiny creatures radiate their unmistakable luminescent light as expert guides provide informative commentary on the Waitomo’s historical and geological significance. Marvel at Mother Nature’s light display as you glide silently on a boat through the starry wonderland of the Glow worm Grotto. After visiting the caves stay in the area and take a drive to Mangapohue Natural Bridge. The bridge is accessed via a walking track that crosses the river a number of times, through native bush along a boardwalk through an impressive limestone gorge that passes underneath a 17 m high natural arch. Drive to the night’s accommodation. Sanctuary Mountain Maungatautari is a world class conservation project. It encompasses 3400 hectares within a 47km predator free fence. The mountain is home to several endangered and vulnerable native species. Hihi /stitchbird, Kaka, Takahe, North Island Brown Kiwi, and Kokako. There are a number of walks available or you can take a guided tour with one of the expert staff to identify and discuss the wildlife and fauna you see on your tour. Continue on to Arapuni, a small town in the heart of the Waikato district where we will drive across the narrow dam that houses the Arapuni Power Station to have lunch at a local café. Walk across the historic swing bridge over the Waikato river to the Power station that was camouflaged during World War 2 to prevent it being bombed. This is an opportunity to see a little local town, stretch your legs and take a breath of some wonderful fresh air in a natural environment. Drive to Putaruru and stop at Over the Moon Cheese Factory that creates New Zealand’s widest range of specialty cheeses made from goat, cow, sheep and buffalo milk. The boutique factory has been producing specialty cheese since 2007 and has won international acclaim winning more than 120 medals and trophies. Sample a selection and you can purchase some to take away. Finally, we drive back to Rotorua, our hub and the completion of this tour where we will deliver you to your accommodation. Cost from $475 per person per day based on twin share. Includes transport, guide and driver, accommodation and breakfast on Day 2. Excludes entry fees to attractions underlined in the Itinerary.